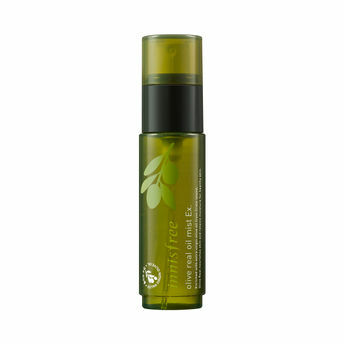 The Olive Real Oil Mist by Innisfree is a two-layered, deep hydrating oil mist with Olive Power Activator (tocopherol and vitamin E) that provides powerful moisturisation for dry skin to improve skin suppleness and create a moisture barrier. This 3-in-1 essential mist forms a moisture shield on overly dry skin to immediately provide a function as a protective shield for balancing oil and moisture, prevent the skin from looking flaky due to excess dead skin cells, and help makeup products adhere better to the skin. Vitamin E and Olive Oil form a moisture shield to prevent moisture loss and to moisturize overly dry skin. Innisfree Olive Real Oil Mist Ex.